Fifty-year-old Sushila Pyarelal Sharma grew up in the precincts of Chhatrapati Shivaji Terminus (CST), the Gothic giant that is a Mumbai landmark and, in many ways, epitomizes the bustle of the city. It’s not surprising that it was a target on 26/11; that day the terrorists killed 52 people there. Sharma’s father was a railway havaldar and they lived in the railway quarters at Wadi Bunder. As a child, she often accompanied him to work and played with her siblings at the railway station. She knows CST more intimately than those who commute to and from it every day and has seen how it has changed over the years. “I have never seen the station so silent and deserted as on 26 November. The few people walking around were like ghosts. Any movement made me jump." Sharma’s brother is a clerk with Central Railways, and she is the the head of the CST cleaning staff, better known as safaiwallas. A moment after she recollects a happy evening spent playing with her brother at the railway garden close to CST, she recalls with horror how the same gardens looked in the dark when she, along with other railway employees, hid in the administrative offices while the terrorists fired indiscriminately on the platforms. 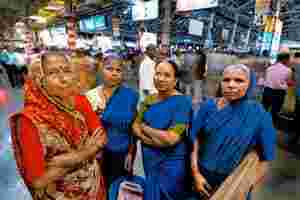 Every day, the six women meet in the passengers’ waiting room, change into their blue saris, clean the locations assigned to them, and then gather in a narrow corridor near the station’s administrative offices for chai. They then go back to work and meet once again for dinner. The sight of blood is not new to them—they often have to clean the platform or tracks after a railway accident. But the bloodshed from the terrorist massacre is etched in their memory. “There was blood all over. It had dried and the stench was unbearable and there was a hole on the floor where the bomb had detonated. I felt sick, so I only cleaned the pieces of glass near the exits," says Shevavati, one of the cleaners on duty that night. Shevavati, who is in her early 40s, says she would like to stay away from the station at night, but she has young children and can’t afford to stay at home. “We worked mechanically that day but later I could not sleep well for a very long time," says Sharma. “Even Hirabai, who is mentally very strong, could not eat anything for two days." Hirabai Thuda, one of the other cleaners on duty that day, remembers the steel benches that had fallen over, the shoes, pieces of glass, bullet shells, and shirts and bedsheets strewn all over. The carnage has left its scars. “I cleaned all that blood myself, probably that’s the reason I still get nightmares," Parvati Babu Sonavane says. “Even today, if the coolies drop a parcel, and there is a thud, I feel scared," adds Sharma. At a time when reaching home safe was on everyone’s mind and those at home sat glued to the television, these women worked overtime to scrub CST clean—but none besides Sharma got even token appreciation. Central Railways gave Sharma a certificate and a cash price of Rs1,000. Her reasoning sounds both practical and philosophical. “They probably gave me the prize because they can’t be appreciating every one of us," she says.